Interruption to Services: PLEASE READ! The nano team are participating in a couple of film festivals in Europe in May. First to Oberhausen, then to Kinodot in St Petersburg! During this time please send in your films to nanolab as usual. Turn around times however will be very slow I'm sorry to say. A bit over two weeks. I am afraid we aren't able to speed that up at all. Sorry for the inconvenience. Film stock purchases will be available as usual. Just fill in the online form! We now have an online order form for film processing! And we also have a new online order form for purchasing film stock! Nanolab can now offer scans in 4K! Our 4K transfers have a pixel ratio of 3840 x 2160. The 4k scan will show you the entire film perforation as well as the old 'sound track' edge without the traditional black bars on the sides of the 4:3 super 8 image. This is ideal for a 4K timeline. Also ideal if you want to take a 16:9 slice from your 4:3 super 8 frame for an HD or 2k timeline. You can choose that slice yourself! Cost for the 4K transfer is $50 per roll. Our preferred method of data delivery now is just by upload. No need to send any media! Nanolab is a super 8 processing lab. We develop super 8 film here on site in Victoria! Yes, the films you send us for developing can also be trasnferred to digital by us. We generally don't transfer films not developed at the lab, simply becuse our transfer setup runs at capacity with the films we develop. We no longer process old types of film I'm afraid. So for any Kodachrome, Agfachrome, Agfa Moviechrome, Pacific, Focal, or 160asa films, you need to send them to filmrescue.com in Canada. WE SELL AND PROCESS MOVIE FILM! For details about the stocks we process, our processing rates, and how and where to send your films see our Processing page. 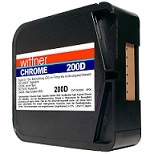 To buy film see our Film Stock Sales page for a full list of prices and details on how to order. For transfer of film to digital video see our Telecine Service page. 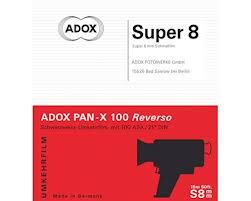 Kodak has released a new super 8 film! It is Ektachrome 100d / 7294, a 100 speed, daylight balanced colour reversal film. (This is on top of the 3 colour negative films and one black and white film that Kodak make for Super 8 - see our film stock page for all the offerings). 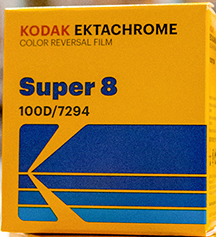 This new Ektachrome film is the only colour reversal (colour positive) film available in super 8! It is very beautiful. But it is also quite expensive. Cost is $70 per roll. We are keeping a small volume of this in stock at the moment. If you buy it, we can develop it for you. A few notes about this film. This is the ONLY currently available colour film that you can project in a super 8 film projector. If you must be able to project your film in a traditional film projector, this is the film for you. BUT unlike with colour negative, with colour reversal film exposure is CRITICAL. You MUST have a camera with a working light meter to use this stock, buautiful though it is. Also note that given the price we are getting very few of these films in to process. As such, there is no quick turn around for this stock. Expect developing to take a couple of weeks. nano lab processes all films using manual equipment. There are no machines! This means there can be no scratches caused by build-up on rollers. Hand processing allows us to process your film quickly and using fresh chemistry. We don't need to wait for large batches or use potentially ageing chemistry. In this way our turn around time is generally only a few days. Having said that, it is important to note that we are only human. We make absolutely every effort to process your film to the highest possible standard, but like any lab we can take no responsibility for any loss or damage that may occur, even through our own negligence or that of our agents. Our liability is limited to the value of the film stock as a maximum and is determined at our discretion.